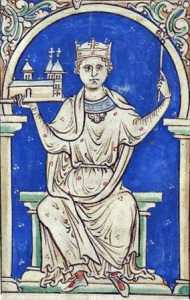 King Stephen and his wife, Matilda of Boulogne, had 3 children who survived infancy, and yet – on his death – Stephen left his throne to Henry, Count of Anjou and son of Stephen’s bitter enemy, Empress Matilda. Matilda was Henry I’s only surviving legitimate child, and designated heir – but she was a woman and England’s nobles were reluctant to be ruled by a woman. Stephen was Henry I’s nephew, one of his closest male relatives and in the confusion following Henry’s death it was Stephen who acted quickly and decisively, and took the crown. What followed was a period known as the Anarchy, almost 20 years of conflict and bloodshed as Stephen and Matilda battled for supremacy. Ultimately, Stephen managed to retain control of England but Matilda’s eldest son, Henry, was eager to win back his birthright.